It belongs to Kim, the hiring manager for that cake job. You know, the one with profit sharing and an on-site fitness center. She's got 300+ resumes to read, and yours is one. But if your resume is one page, will she think, "Meh, too flimsy?" If two, will she think, "Oh no, War and Peace?" So, should a resume be one page, or two? I have good news. There's an answer. It just depends how many years' experience you've got. How to write a one page resume that gets more interviews. How to make your resume one page if it's too long. 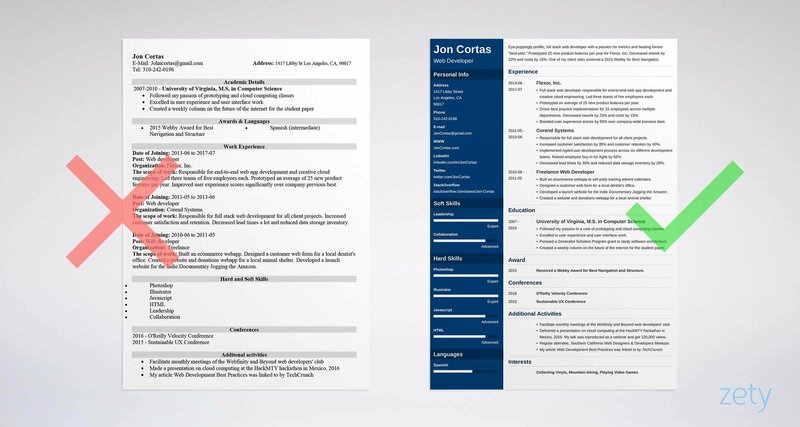 A one page resume template you can use to get that dream job. Here's a sample one page resume made using our resume builder. Example of a One Page Resume - See 20+ resume templates and create your resume here. How long is a resume supposed to be? The experts say, "It depends." On what? The table below answers all your 1-page resume questions, fast. Don't stop here though. Read on for the reasons behind the answers, plus tips on how to trim the fat. Should a Resume Be One Page Long? A resume should be one page most of the time. One-page resumes are recommended for candidates with just a few years of work experience and those who are only starting out on the job market. Your resume can be longer than one page only when you have 10+ years of experience or lots of relevant professional achievements. A resume is like a movie trailer. Trailers run about 3 minutes. Should a trailer for a longer movie be 6 minutes? The real question is, "How do I make my resume look good?" In most cases, the answer is, use only your best achievements that fit a single page. As we'll see, some job offers will demand a two-page resume. So, how many pages for a resume? Is It Better to Have a One Page Resume? A one page resume is usually better. According to a survey of hiring managers by Saddleback College, 48% of employers want a 1 page resume. The exception? A two page resume works better for positions that require 10+ years of experience. The reasons for a 1-page resume are clarity and ease of use. A single-page resume stands out. It's more approachable. The manager doesn't have to wade through a gigantic wall of words.That makes it easier to find your best achievements and hire you. The reasons to avoid a one-page resume are experience and looking flimsy. If you're going for a job that requires 10+ years of experience, you need to show it. A two-page resume crammed with achievements does that best. Resumes don't have to be one page, but it usually helps. Unless you've got over a decade of experience, you can fit it in one page. Think of that movie trailer again. Just put your best bits in that fill the space. Cut the rest. Can a Resume Be 2 Pages? If you've got lots of experience and achievements related to the job offer, a short resume can actually hold you back. A two page resume (or 3-page) can work for managerial jobs, executive-level jobs, veteran project managers, and so on. Should a Resume Be One Page or Two? In the old days of paper, fax machines, and stegosaurus battling men in horn-rimmed glasses, one pagers were paramount. Now, with email, Applicant Tracking Systems, and keywords, the shackles have been lifted from the 2 page resume. Even so, a single page is generally better. An Elon Musk one-page resume sample has made its rounds on the internet. Supposedly, it's proof there's never a reason to use two pages. First, Musk could get a job with a resume on a postage stamp. Second, it used nearly microscopic font. Pro Tip: Now that you know most resumes should be one page, your next step is to do it right. See the next section for tips on how to make a one-page resume. Still convinced you need more than a one page resume? Double-check with this guide: How Long Should a Resume Be? The Definitive Answer. Need a single-page resume, but don't know how to do it? If you've got less than five years of experience, you almost certainly need a one-page resume. Here are several tips for how to fit a resume on one page. It's okay to have 4-page list of accomplishments. Just don't put it in your resume unless you're going for a senior position. Customize your resume for each past job. Show 3-5 achievements that fit best with this job offer. Custom-fitting will help save space and cut the chaff. Save space with bullet points instead of paragraphs. Bullets are the best way to describe experience and education on a resume. Make them 1-2 lines each. You should never need a 3-line bullet point. Short, punchy statements work best. 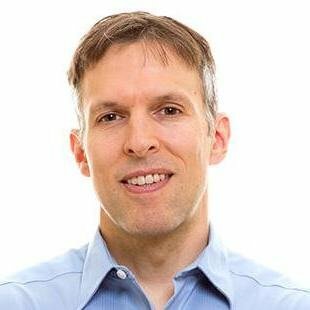 Use 3-5 bullet points per past job max as a space-saving technique. Your bullets should show your best few measurable achievements. Make them the most impressive things you did at that job. Make sure they're relevant to this new position too. Say you racked up 30 amazing accomplishments at your last job. Does your next employer really need to know about them all? It's enough to share the top few. Again, this is a commercial, not the full movie. Save space by tossing out redundancies. Unless you're going for an internship or entry-level job, experience trumps education. Experienced applicants should list 2-3 bullet points in their education sections. The exception? If you've got extra training specific to the job, show it. Don't use one page resume format doc free downloads. Why? Single page resume templates in Word can turn out longer on the hiring manager's computer. Resume in PDF or .docx? We say PDF. Word docs look different on different machines, but PDFs don't change. Many applicants add "references available upon request" at the bottom of their resumes. Skipping that part isn't just a space-saving technique. It also prevents cluttering up your resume with something managers already know. As a resume coach, I've seen some egregiously-long summaries. I've read resumes with 10-line openings, followed by 9 bullet points. That's not a summary. It's an entire resume. Cut your resume summary to 3-5 lines of text, with short sentences. Stick to accomplishments to keep your resume 1 page. Don't list rambling job descriptions. Instead, discuss money you saved, time you saved, or quality you improved. Focus on specific ways you used key job skills to make things better for your company. Yes you can make the resume font size smaller to make a resume one page. Just don't go overboard. A tiny font makes life harder for the manager. It also shows you cut corners, slapping half-baked solutions onto problems. Toy with margins to save space and hit the one page resume sweet spot. Just like with fonts, there's a limit to how far you can go. The key is not to clog every square millimeter of the page. White space makes your resume less daunting. Try using multiple columns or different resume layouts to fit more content. Not a graphic artist with advanced layout skills? Use our resume builder to get your layout right the first time. You'll get several free one page resume templates to make the process easy. Pro Tip: Need more tips to write a great 1-page resume? Start thinking about what you can cut entirely. See the next section for an actionable list of space-savers. Can't cram it all on one page? Maybe you don't need to. Like a sinking air balloon, a too-long resume can toss unwanted items to shed weight. You might be surprised to learn you don't need any of the sections shown below. Cut them entirely to help with fitting a resume on one page. In most cases, you don't need a full street address on a resume. Leaving it off is a good way to save space. It also saves time for the manager, since it cuts unneeded clutter. It's enough to list the same city as the job. If you've got too many great achievements to make your resume 1 page, you definitely don't need high school on it. Include your wonder years only if you're having trouble filling that first page and you need extra material. Toss out any job that's more than 10 years old. The same goes for jobs that aren't related to the new position. List older experience only if you're having trouble filling up page 1 of your resume. Even then, add achievements that fit the new position. Leave off any references. If you have to include them, don’t say "references available upon request." It's assumed, and it takes up valuable space you need for your impressive achievements. Learn when and how to list references on your resume here. To save space, skip "other" resume sections like interests, hobbies, volunteering, and additional activities. These details make great additions to a resume when they're related to the job offer. For instance, if they prove you've got a desired skill. Otherwise, you can drop them. Pro Tip: Need some great examples of one-page resume templates for every profession? See the next section for a link to dozens of guides. Nothing ramps up background stress like a blank page you need to turn into a resume. So, don't start from scratch. We've got reams of one-page resume templates to slingshot you to an avalanche of interviews. Pro Tip: Got lots of experience for a job offer that demands a highly experienced candidate? If so, you can write two or even multiple page resumes. First, know whether you should write a 1 page resume. If the job requires lots of experience, a 2 page resume is okay. Everyone else should stick to a single page. Next, cut the fat. That's as simple as saying, "I have one page to fit my resume into." Cram in the best bits that fit the job description and leave out the rest. Finally, use the one page resume examples in this article. A good 1-page resume example can save a ton of work. Want to know more about how to write a 1 page resume? Maybe you've got some great one page resume ideas? Give us a shout in the comments! Let's start the conversation! Struggling to fit your resume on one page? Check out our list of the best 1-page resume templates that’ll let you put all your important information on a single page. Stop worrying that recruiters will skip your resume because it’s too long! Pick from 15 modern, creative, or basic templates and start getting more offers!